A Holiday Deals on Black Friday 2017 is approaching. And as the usual Turnkey Internet has made big discounts waiting for you. Now you can buy C10 hosting plan just only $1/month(normally $9.99) and Unlimited hosting plan $3/month (normally $14.99). All plans are unlimited space, bandwidth. 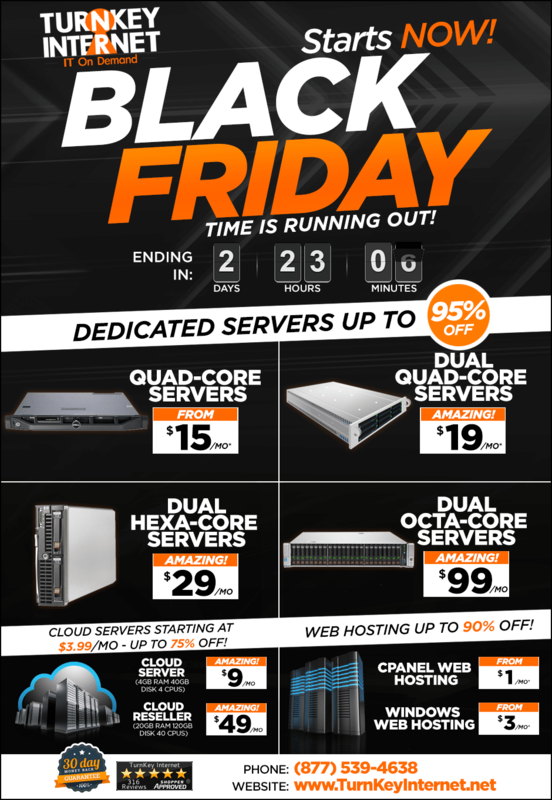 On this Black Friday deal, you can buy Dedicated Quad-Core servers from only $15/month. Cloud servers from only $3.99/month. After this promotion, if you need to find the turnkey internet discount code you can visit here.